I’ve shared my Peanut Butter Coconut Balls recipe and oh they are yummy. They are probably one of my top 5 favorite recipes. 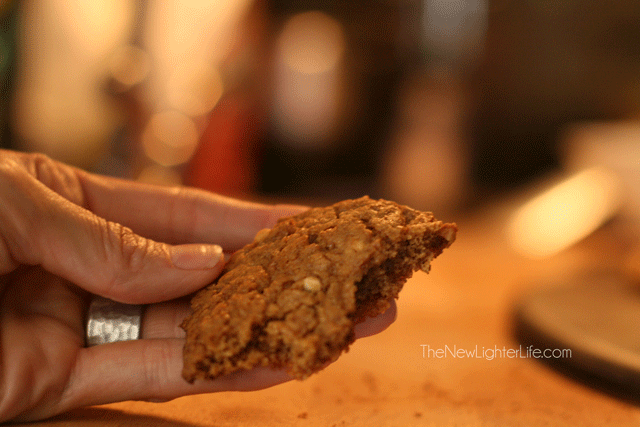 But today, it’s all about Peanut Butter Cookies. 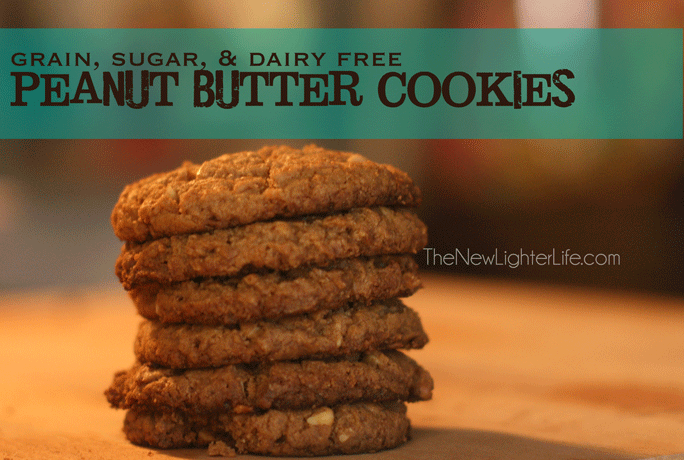 These Peanut Butter Cookies are sugar, dairy, & grain-free. You will need 2 special ingredients, Xylitol and almond flour. I order them from Swanson Vitamins (that is a referral link), but check local sources, (you may find a better deal). Xylitol. This stuff is no joke! It doesn’t make your body’s insulin spike, is good for your teeth, bad for your dog, and can cause….ummm…flatulance or gastrointestinal issues if eaten in large quantities. I LOVE xylitol in my no-sugar baked goods. But some people CANNOT tolerate xylitol. Know your body. If you want to use a more natural sweetener you can. But if you do decide to make these cookies with xylitol, WARN your husband/wife/children not to overindulge. Mix the peanut butter, xylitol, egg & vanilla. Add almond flour, salt and baking soda and stir until throughly mixed. 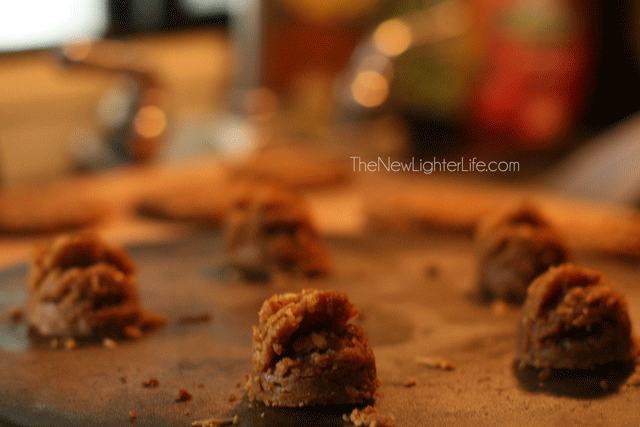 Take a cookie scoop and scoop batter onto an ungreased cookie sheet (I use stoneware). Press down the scooped dough with the palm of your hand. Bake for 10-12 minutes or until the edges are slightly brown. Remove from oven and let them sit on pan for a few minutes to make easier to remove. Let cool on a wire rack. Now let’s talk about texture. Since there is NOT an ounce of sugar in these, they end up being a little more cake-like in consistency. Sorry. I don’t know any way around this other than by using sugar. But trust me when I tell you, they are so delicious! The man of the house called them “little morsels of goodness”. And he is a hard sell on anything sugar-free. This post has been linked up for Trim and Healthy Tuesdays at Gwen’s Nest and Stacy Makes Cents. BAHAHAHAHAHAHAHAHA!!!! 🙂 I love how you put that “important note” in small text. 😉 Thanks for linking at Trim Healthy Tuesday! These look fab-u-lous! I love the cookies, taste is great but they fall apart. What am I doing wrong? I’m not sure Rhonda. :/ I know when I make them, they are more fragile of a cookie, (likely due to the flour and lack of sugar). Thanks for sharing this recipe, can’t wait to try it. Question: can Truvia be substituted for some or all of the xylitol? Thanks again! Tessa recently posted…Welcome Home Soldier! Yes Tessa, you can sub in all Truvia for the xylitol. Hope you enjoy them! They look perfect! I’m new so, I’m still learning the details. Thanks so much!!! I’m sorry Claire, I haven’t made them for a while but I think they made 12-18 cookies. i made them once using organic sugar and they were perfect. Made them again substituting maple syrup but using a 1/4 c. less and the batter is way too loose. That is good to know, Lisa. Thank you!